Bikeability training is due to start later this month at Dobcroft Junior School in Sheffield. A letter was sent to parents of children taking part which includes advice on allowing children to cycle to school alone. 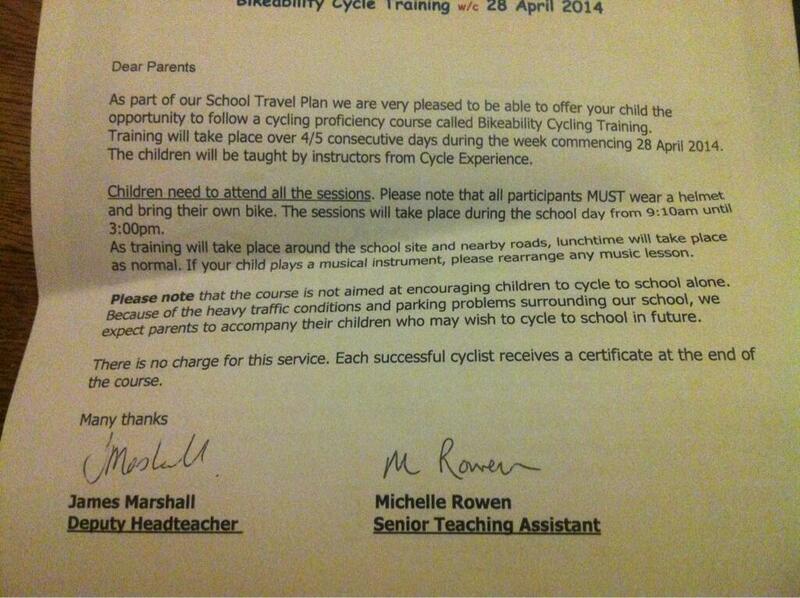 Please note that the course is not aimed at encouraging children to cycle to school alone. Because of the heavy traffic conditions and parking problems surrounding our school, we expect parents to accompany their children who may wish to cycle to school in future. It is the responsibility of our MPs and Local Councillors to change these conditions so that children can cycle to school alone safely. Sheffield Council’s current programs for improving conditions for cycling are woefully inadequate and this letter shows how far we still have to go. By investing in training children to how to cycle, but failing to provide the infrastructure necessary to support them we are simply wasting our time. We need to transform Sheffield into a place where people of all ages are free to walk or ride a bike without being fearful. We can do this by changing the way we think about designing our roads, by prioritising the needs of people rather than allowing the car to become the only realistic choice. Thanks to Edale Skyline on Twitter for sharing this. This entry was posted in Uncategorized on April 2, 2014 by Matt. Should we as CycleSheffield write to the school to highlight the Space for Cycling campaign? I’m not sure the school will be able to do anything about the road conditions, but I don’t think it would hurt to write to them. 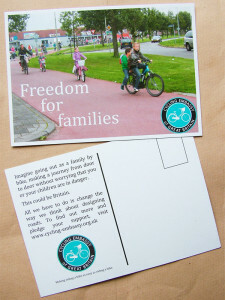 This blog post is almost an exact copy of a letter I’ve just sent to Leigh Bramall and my Councillors (and I included a Freedom for families postcard). Great post Matt. I find the situation in Sheffield quite depressing. I’m an experienced and assertive rider, but find riding with my son who is now 11 really very stressful. Despite having done bikeability, having very good bike handling skills and having more experience of road riding than an avarage 11 year old he still requires a lot of supervision and instruction as our roads are just too busy and complex. Having to watch out for him and myself, ride defensively and shout out instructions constantly is draining and takes alot of the pleasure out of riding, to the extent that I often feel forced to drive or take a bus. Certainly the spontaneity is removed from riding as routes have to be planned in minute detail to avoid busy routes and difficult junctions. I long for dutch style infrastructure, to just hop on our bikes and go, without all the worry and hassle. I really wish I didn’t have to look at a cycle map whenever I go to a new area! I love the “MUST wear a helmet” (why there’s no law saying the need to), but no mention to make sure that parents check whether the brakes work (which the highway code says is essential). The amount of kids riding round with no brakes (or adult brakes that they can’t operate is terrifying). Still at least they are doing bikeability at all, Hunters Bar seem to have given up.